Mama cat moved her babies during the night. I checked this morning and they were all gone. So Jethro has the run of the back yard again. But he's disappointed that they aren't there anymore. I had a good, busy day at work, enlivened by an adventure at mid-morning. Suddenly Marcie came running out of her office making squeaking noises. She'd looked up and seen a bat hanging from the ceiling. I checked it out - it was a tiny little brown bat, sound asleep. Charlie headed for it with a broom. I suggested catching it and letting it go outside, so he did. He got up on a ladder with a tin and a piece of cardboard. He let it go about a block away, hoping it doesn't find its way back in. We have had bats in the basement for years, but this is the first time in anyone's memory that one has come upstairs. So we got into the whole bat discussion. I've always been baffled by the fear of them. They can't hurt you, they eat mosquitoes, and they're absolutely beautiful - what's not to love? People that are afraid of them can never give me a reason for their fear. I don't get it. I was thinking about that today and realized something important. My parents didn't teach me to be afraid of anything, certainly not an animal. They taught me to respect things and be cautions where it's warranted, but not to be afraid. I learned early how to recognize poisonous snakes and how to handle a rip current. I know how to handle myself when I'm alone in an unsafe area. I know how to take down a dirt dobber nest safely. And I certainly know that bats won't hurt you. Mama always called me to come and see how wonderfully God made things. Bats must be the pinnacle of His creation. And I have a lot of my grandfather Keistler in me, too - I love animals just like he did. Especially bats. 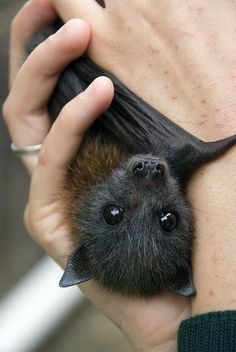 Thank you for loving bats, too. Thank you for all those hours we spent together in the Nocturnal Animal House at the Cincinnati Zoo. I'm glad you were a zoology major - we could speak sciencese to each other. Thank you for being so kind-hearted toward all creatures. It occurs to me that bats go to Heaven when they die. I can't imagine how many there must be for you to watch. Do you get to play with them? How wonderful to be there where they aren't afraid of you anymore! For now, I'll have to be content with wandering kitten families and a bat that escaped with its life today. And Jethro and his three kitties, and his designs on every cat in the world. And the hope of being there with you someday.